Here is a timely snippet from the Joseph McGarrity personal papers collection. 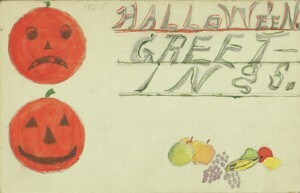 One of McGarrity’s daughters, Catherine Meave, sent her father Hallowe’en greetings on October 22, 1925 from Atlantic City. The letter and poem are transcribed below. I made this poem up, and drew and painted this card for you for Hallowe’en. Always giving you a stare. Catherine also included a card with drawings of jack-o’-lanterns and fruit. Unfortunately, we have no dates associated with Catherine, so we do not know how old she was when she sent these. We do, however, have McGarrity’s reply to Catherine, in which he praises her “gift of Poetry” and expresses his delight at receiving her card and poem. It is always a pleasure to find such connections among papers. Happy Hallowe’en from the Digital Library!